10 foot ceiling heights in this new home design help expand the overall space for the kitchen design and provide enough height to include the beautiful stone hood. 10 foot ceiling heights in this new home design help expand the overall space for the kitchen design and provide enough height to include the beautiful stone hood. 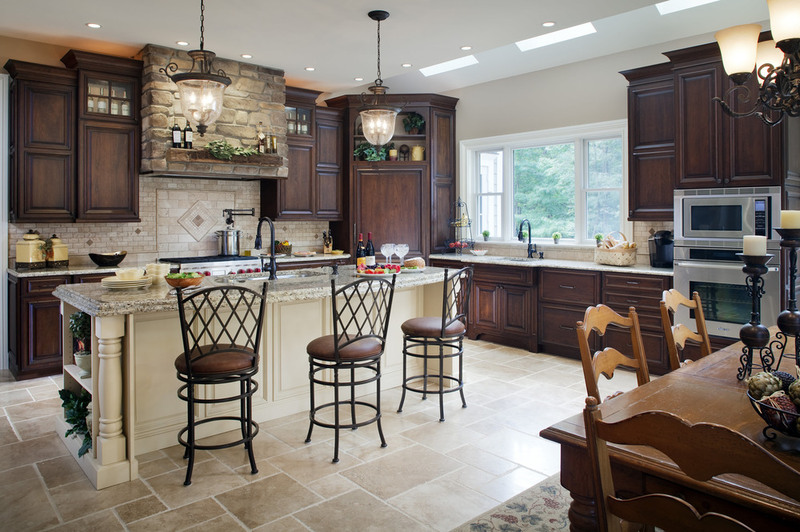 The blackberry stained cherry cabinetry for the main cabinetry provides a striking contrast for the natural stone hood. The island cabinetry is straw color on alder wood, and this light color helps the overall space stay light. The custom desk is included in the kitchen for easy access to recipes and school schedules.